This article examines the ad business on a broad level, and looks closely at how to use or launch an ad network. In 2011, global online advertising was ~$73 billion, comprising 16% of the $464 billion spent on ads of all kinds (print newspapers, magazines, television, radio, cinema, outdoor, internet). In four markets (Denmark, Norway, Sweden and the UK), internet advertising already accounts for more than 25% of total ad expenditure. In a sign of the times, U.S. online advertising will exceed print for the first time in 2012. Print advertising continues to erode in the U.S., and is projected to fall from $36 billion in 2011 to $33.8 billion in 2012. Meanwhile U.S. online advertising is projected to grow 23.3% to $39.5 billion this year. Mobile ad spending is growing rapidly, $1.5 billion in the U.S. in 2011. Google is the top dog of online advertising, earning half of all global online advertising revenue, $36.5 billion in 2011. Another 11% of the world’s digital ad spending is earned by four other major companies, Microsoft, Yahoo!, AOL and Facebook. Collectively, these top search engines and portals have 61% of the ad market. In the realms of science and culture, these major ad networks may pay too little, or have irrelevant ads for your audience. Smaller advertiser networks “should be a good model for culture blogs, since it’s a valuable niche audience if you carefully manage the list of sites,” says Barry Hoggard, co-founder of an arts/culture ad network, Culture Pundits, which ran from 2007 to 2012. Hoggard says a custom ad network “allows the sites to have more control over the kind of ads that appear. General networks like AdSense can show some pretty lousy ads — credit cards, correspondence schools, etc.” Further, “when it’s working,” a custom ad network can pay higher revenue than a general network. But if your primary audience is students and their educators, and the context is educational settings, ads may be inappropriate. If you run ads on these sites, since your site is positioned as an expert source, and you have a young, potentially naive audience, you have an extra responsibility to have nonintrusive ads that are not misleading. If you have a niche audience, of professionals in your field, or knowledgeable enthusiasts, you could build your own pool of advertisers. Hoggard says a good minimum for a culture-oriented audience is 1 million page views a month. He says, “Below that, it can be hard to get the attention of a lot of media buyers.” However, “if you have a niche audience with good demographics that is attractive to advertisers… you can be a lot smaller.” Rennie agrees with that ballpark, for science-related sites, and estimates that a “few million” monthly page views is the minimum for interesting major media buyers directly. 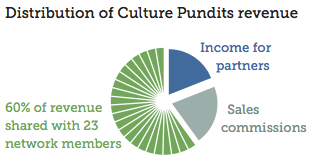 Culture Pundits was a well regarded arts & culture ad network that operated from 2007 until January 2012. 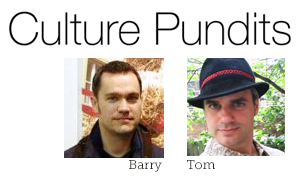 Culture Pundits was founded by Barry Hoggard and Tom Schreiber. Their sites served an audience of arts professionals and enthusiasts. Their member sites were all cultural blogs or art, film, literature calendars. They excluded sites that focused on design or fashion, although those sites have higher traffic. 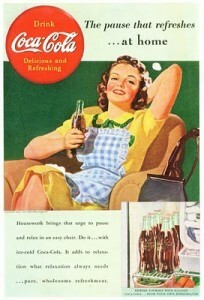 Their advertisers tended to be art-related institutions, galleries, publishers, museums and businesses. They ad network launched in August 2007 with ten sites, expanding to 40 websites, and 1 million page views per months, by September 2008. By May 2009, managing the ad network became unwieldy, with advertisers requesting targeting of specific web sites, and geo targeting. To make things more manageable, Culture Pundits tried reducing the pool of advertisers to 10 sponsors each month, cut back to 25 sites, and reduced visual clutter by delivering a single medium-size ad (300×250 pixels) across all of the sites in the network. The network paid 60% of revenues to its publishers. The balance of 40% paid sales commissions and administrative costs, with a little left over to pay the two founders’ salary. Ultimately, the network, while profitable, was not a good business. Over 5 years, ad sales fluctuated. They sold out their full ad inventory 3 times, but most months, they sold only a third. When they closed down the ad network, they were drawing in ~$2k/month, paying out ~$1200/month to member sites — each site earning less than $100/month, on average. Hoggard says, “It’s a lot of work to educate organizations about the value of a niche network like ours, versus just doing targeted Google AdWords campaigns. There is a lot of hand-holding.” His colleague, Schreiber, did most of the negotiations. Other tasks included managing the ad serving software, managing finances, and providing technical support to publishers and advertisers. There were often delays to get creative assets for ads, and also to get paid. In all, it became too time consuming. While they had found a good niche, with satisfied publishers and advertisers, many of whom made repeat ad buys, Hoggard says, “In the last six months [of 2011], our revenue was really down compared to any other six-month period of the last 3-4 years.” Given the other projects he is working on, Hoggard decided to spend his time on making those more successful. The top ads are managed in-house, and link to pages at George Mason, or well respected TV, magazine and retail advertisers. They charge $400/month for banner ads on the lower sections of their pages. When they don’t have interested advertisers, they are at the mercy of their ad network, which was promoting two misleading sites that hustle readers to get on mailing lists for commercial online and technical colleges, a scammy site selling questionable health supplements, and Johns Hopkins. At the bottom of their page, they run irrelevant text ads for discount men’s watches, ways to make money fast!, and a misleading site for Green Card applicants. Single, small ads. Left: reformrevolution.com with an ad via InfluAds; Right: alistapart.com with an ad via The Deck. The single ad approach was pioneered by The Deck network, which delivered 114 million ad impressions in January 2012. The ads are 120 pixels wide by 90 pixels tall and also allow for up to 80 characters of text to accompany the image. It’s an appealing model. The Deck charges $8300 USD per ad per month, and rotates 33 ads a month. “[The Deck] inspired us and our objective is to democratize that model,” says Damião, whose network offers a number of niche topics, and runs small ad sizes (130×100, 154×70, and 250×250). At Culture Pundits, Hoggard also used single ads, though he found that a slightly larger size (300×250) was “better-suited” for their arts & culture advertisers. It’s an issue of quality of quantity, says Damião, “We are publisher + quality focused, while other networks are advertiser-demand + quantity focused.” For business-related sites, InfluAds pays around $4-5 CPM, and design-related sites tend to earn around $1-1.6 CPM. InfluAds has a full dashboard for publishers to monitor their accounts, and pays 10 days after the month. Freethought blogs is a blog network of 31 blogs, centered on a theme of independent thinking and skepticism. In December 2011, the site earned ~$10k. The blog network had 6.4 million pageviews in January, averaging 200k pageviews daily. The site is a spinoff of Scienceblogs begun by PZ Myers and Ed Brayton, and has some of the same contributors. They had ads from when they launched. “I spent several thousand dollars to get the network off the ground and it was the intent from the start to derive revenue from the network and to pay all of our bloggers based on their percentage of the site’s full revenue,” says Brayton. When they first launched in August 2011, Brayton tried to manage the ads himself using Google Adsense and other networks, putting them into a Doubleclick server. “But it was very time consuming and our revenue was pathetically low,” so he decided to turn advertising over to a private ad manager who runs the ads for independent news and politics sites, Raw Story, Alternet, Crooks and Liars, and some others — which immediately tripled their revenue. Brayton occasionally does direct ad sales, augmenting the advertisers solicited by his ad manager. Freethought has five ads on each page: A wider banner (728×90) on the top, and four medium size squares (300×250). In December 2011, Freethought had about 5.7 million page views, and their revenue through the Raw Story ad manager was about $6800, with a total CPM rate of ~$1.20. They draw additional revenue from a popunder ad from 3I Interactive, that earns about $800 a month, and they also run their own Google Adsense ads on our RSS feed and search feeds, which bring in anywhere from $400 to $900 a month. And he has some direct ad sales of ~$500 a month. 3 Quarks is a filter blog with diverse contributors, collecting information from around the web on science, design, literature, current affairs, and art. S. Abbas Raza, the founder and editor, says they had 430,000 impressions last month. The site launched in 2004, and they’ve had ads for over 5 years. Running ads was an easy decision. Raza says, “We didn’t wring our hands over it at all. We wanted to make some money, and so we ran ads.” He spends 2-4 hours a week managing his advertising. Their ad revenue varies widely. The advertisements run in a strip on the right side of the screen. Raza is satisfied with his advertisers. They use Blogads, Google Adsense, and a few direct text link ads. Today, they have text ads for tickets at Las Vegas shows and Florida theme parks, and image ads for several books, a professional society, a legitimate institution promoting online courses on social research, and five nonobjectionable Google text ads. Another form of advertising is sponsored posts, which can be appropriate for some sites. A good example of sponsored posts are these posts at business analysis blog Asymco for Carnegie Mellon University, and mobile app Scrivener. The sponsored posts on are topics the blogger would not normally cover. The sponsorship network, The Syndicate, charges advertisers $2,750 USD for a single post on sites with combined 1,500,000 monthly page views. The Syndicate sends the blogger possible topics to approve, and draft text for the post. The blogger edits a short description of the product or service she or he’s willing to endorse, adding a personal note. Sponsored posts can be paid a flat fee, or the publisher can receive a commission for each click. More broadly, if you are thinking about adding ads, will you lose your integrity? Not necessarily. There is vast precedent you can draw on. See their detailed guidelines, most of which apply to your site, or at least offer good food for thought. Impression – Each time an ad is viewed. There can be multiple ad impressions per page. Publisher – This is you. The term is a holdover from the days of print marketing. Flat-rate – An ad runs on a site for a specific time period. Ad could be 100% of the time, or rotate with others, to appear with a specific probability. CPC – Cost per click. Advertisers only pay when a reader clicks their ad, regardless of how many impressions. This is how Google’s ad system, and many others work. CTR – Clickthrough rate. A high CTR means ads are more appealing to readers. Number of clicks ÷ number of impressions. CPA – Cost per action or acquisition. Advertisers pay a commission for an action, such as becoming a new customer. e.g., if NetFlix paid a $20 commission for new customers. Similar to CPL, or cost per lead. RPM – Page revenue per thousand impressions. Earnings ÷ number of page views * 1000.
eCPM – Same as RPM, but from the advertisers’ point of view. Effective cost per 1,000 impressions. CPC/A * CTR * 1,000. Text vs. Image or rich media – Text ads tend to be 1-2 sentences plus a link; Images are a graphic; Rich media are animated or have other interactivity. Mini, small – Small, subtle ads. They don’t annoy readers, and fit into many layouts. Skyscraper, Hi-rise – Vertically oriented ads, typically tall and skinny. Leaderboard, Marquee – Horizontally oriented ads, typically full screen width, and short. Roadblock – Exclusivity. Advertisers gets 100% of the advertisements on a site for a short time, useful for important announcements and product launches. Sponsored post – An alternative to ads; a sponsored post is part of the site’s content, and is clearly marked. Analogous to an advertorial, but not misleading. Above the fold – Newspaper display space is more valuable “above the fold” on the front page, as is the section of a website visible without having to scroll down. It’s possible to run your own ad network, but profit margins are tight if you focus on a niche audience. A new ad network could serve multiple publishers, or one blog network. While there are already a lot of science blog networks (see my post on blog networks last year, or this list from scienceblogging.org), there’s room for more blog networks that focus on specific fields (e.g., neuroscience, mathematics, etc. ), or new networks that focus more on the general public and/or content that will be useful for educators to use in a classroom. In culture and the humanities, there is a lot of potential for new blog networks, and many untapped advertisers. Culture Pundits solicited advertisers who were museums, galleries, shows and retailers. There may be potential interest from retailers (e.g., a retailer selling antiques for history-themed sites), online courses, and industry-specific vendors for sites that target professionals, and other advertisers. If you want to partner in making new ad network for a science or culture-related sites, and have over 1 million (preferably 2-3 million) views a month, InfluAds wants to expand their networks, and is a possible place to start. Watching Hoggard and Schreiber grow Culture Pundits was a real pleasure. It's a shame that their sponsors didn't understand the amazing value these geniuses were providing. They curated the content and the AdSpace and thereby providing a sanctuary for their readership from unrelated AdNoise. Sponsored posts are an interesting way to go, but the CP team developed a sponsored network and handled the curatorial issues on the front end. The readership was able to absorb the tasteful and familiar information they gleaned from the sidebars of the blog posts that kept them coming back. It's too bad that the people looking to buy ads on the Culture Pundits Network had to answer to (in my mind) uninformed bureaucracies that could not fathom the brilliance of having curated AdSpace, thereby forcing a pile of traditional "paperwork" to support the traditional information informed by the 'Talking The Talk' acronyms enumerated above. I really enjoyed not having annoying and distracting information plaguing me while I perused their network. I'm sorry they couldn't make it, but hopefully they have set a new mark for excellence that an informed audience will come to appreciate… strike that! come to expect in the future. It's kind of like XM radio…. how can you go back? Thanks for your comments, Chas. One challenge with arts/culture is that it is not clear who is profiting — i.e., who would be the best advertisers? Further, if you believe (as I do) that most museums should revise their business models to be free or highly inexpensive, then museums are not the right advertisers. In fact, it should be reverse, museums should be able to have free web sites with a ton of content, and use advertisements as a revenue stream. InfluAds has had good success finding advertisers for the business and design fields — often advertising software companies. I wonder what kinds of additional retail/commercial advertisers might be interested in sponsoring culture… or the humanities in general. And we don't want just a bunch of poster and furniture companies. Well, that's the beauty of Culture Pundits. I understand your take on this, but the way you frame it, it puts the onus on the reader spend the time and effort to peruse any and all sites they may have an interest in. The value of Culture Pundits for me is that I can go to a site which provides interesting blogged opinions. And in conjunction with their ARTCAT: the catalog of art happenings in the NYC area, they created a virtual community of sorts that you can go to engage the art scene. The TwitterFeed that they ran on the sidelines was appropriate to the muse of their network… a conversation that you can be part of and a way to fine tune your NYC (and beyond) experience. So it isn't so much about some myopic advertising opportunity for museums and like cultural institutions, (that's the part the bureaucrats mentioned above don't seem to get) it's more about cultural sponsorship opportunities that reveal a deep interest in a: well educated, financially capable, learning-as-hobby community that would follow bloggers on a network like the Culture Pundits. Organizations that provide in this way for the communities they serve wind up being household names and thereby part of the community's conversation. This makes the 'who is profiting' question moot, the community looks at the institution as a member and supports it accordingly. This model is becoming recognized by SuperCorp's around the world… (book by Rosabeth Moss-Kanter), its a bit more abstract than the average buyer of advertising might care for due to the required ROI reports to their superiors, but it's very powerful leverage in the end. P.S. I would love to see no admission at Museums in theory, but can you imagine how crowded they would be then? Unthinkable really! There have been many advertising companies that came out due also to the increasing number of demands the clients want. From below the line to above the line ad agencies, all of them have different strategies to having an effective promotion. I for one is one of the striving logo designers perth who are helping starting businessmen.